Women's grey sweatshirt from Maison Scotch with a boxy silhouette. 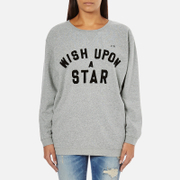 Crafted from a soft cotton blend, the long sleeve jumper features a crew neck, V-shaped insert and contrasting slogan 'Wish upon a star' embroidered to the front. Complete with dropped shoulders and ribbed trims. 80% Cotton, 20% Polyester Model is 173cm/5'8 and wears a size 2/UK 10.